Alumni of the College's graduate management programs serve in leadership roles in a diverse list of industries. They include everything from marketing executives and healthcare administrators to military leaders and beyond. Their success and career preparedness are testaments to the way that St. Scholastica's graduate business programs have evolved over the years to meet the needs of business professionals and the communities they serve. Current offerings include the MBA in Rural Healthcare and the MBA in Leadership and Change - both of which empower students with a deeper understanding of complex business principles, and equip them with tools to drive their respective organizations toward sustainable growth. 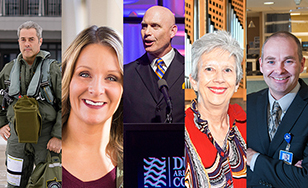 We caught up with five of our distinguished graduate business program alumni to hear more about what they do, and how their degrees have shifted their perspective to fuel success. With a wide range of experience in the marketing field, Erica Danielski understands that change is inevitable. "The only constant is change, so understanding how to anticipate it, proactively prepare for it, and then react as things evolve is pivotal in today's workplace," she said. As senior vice president of The Flint Group, Danielski serves as a marketing strategist for many of the firm's 150+ clients. She saw an opportunity to grow through the MBA in Leadership and Change at St. Scholastica. "As I've spent more time in leadership positions, I've become more and more interested in strategy, personnel, mentorship and being a leader people want to follow," she said. "The coursework was a perfect fit for what I needed at the time, and for further leadership development." As she moved through the MBA program, Danielski said Professor Bob Hartl offered unparalleled insight. "Professor Hartl left a lasting impression on me," she said. "His experience helped us all see practical applications, and he used stories as interesting and engaging ways to deliver the material." And now, when she reflects on her experience, Danielski appreciates the comprehensive nature of the coursework. "There were courses in strategic planning, consumer behavior, research, marketing strategy, and so much more," she said. "I am much better positioned for each opportunity I encounter in a given day, and continually apply things I learned." Some people hesitate to take on leadership roles. Greg Ruberg is not one of those people. Ruberg focused heavily on clinical work for years, working as the director of rehabilitation at Lake View Hospital, and then receiving additional responsibility around Nutrition, Lab and Risk Management. But he wasn't shy about it - administration was in his sights. "After my first role as director of rehabilitation, It didn't take me long to figure out I was interested in management and leadership," said Ruberg, who previously earned both his bachelor's (health science) and master's (physical therapy) degrees from St. Scholastica. After researching MBA programs nationwide, Ruberg found his way back home to St. Scholastica. "On the first night of class, I knew I'd made the right decision," he said. "When the instructor, Bob Hartl, started sharing stories and lessons, I thought ‘this is perfect; this is what I want to do the rest of my career.'" In time, Ruberg found that the concepts he learned, once applied, brought a new level of organizational health. "I can't tell you the number of times I've taken a topic from the program and shared it with our leadership team here," said Ruberg, who was promoted to VP of St. Luke's and CEO/President of Lake View in summer 2016. "You start the program thinking you need to get the degree that opens doors, but when you start using the information in a meaningful way to move your organization forward, you see the true value." For Col. Christopher Blomquist, every day is a unique challenge. That's what happens when you're charged with training, equipping, and maintaining combat-ready forces. "In my role as the 148th Fighter Wing Commander, I oversee over 1,000 personnel, 22 F-16 aircraft, $1B in assets and a $90M annual budget," he said. One of the keys to managing this heavy responsibility has been acquiring a new skill set through an MBA in Leadership and Change at St. Scholastica. "Having an MBA helps build my credibility and confidence in leading such a complex organization," Blomquist said. "I was exposed to a broader view, and focused on the ability to lead and effectively change the culture at any level of the organization." As a mission-minded individual, Blomquist felt the MBA program was consistent with a motto used by the 148th Fighter Wing: "Mission First - People Always." "This program really solidified my way of life," he said. "It showed me real and tangible ways to put people first and achieve a higher level of success in the organization." *The views presented herein are those of the author and do not necessarily represent the views of DoD or its components. For 36 years, Christa Getchell has immersed herself in the world of non-profit organizations. From the YMCA to Park Nicollet Foundation, and now as Chief Operating Officer of St. Andrews Lutheran Church in Mahtomedi, MN, she's been able to connect her work with her own core values. "I'm a values-driven person, and I like to make the connection between mission, vision, and values," Getchell said. As a key leader in organizations for a number of years, Getchell was inspired by her peers to pursue an MBA. "This program was exactly what I needed to move forward as a leader," she said. "To be successful wherever you are in leadership, you need to know how to ethically manage and navigate change." One program experience stands out from the rest - Getchell's Capstone trip to China. "I had the great privilege of traveling with Dr. Lynne Hamre for my Capstone," she said. "It was 15 days of learning a different culture, experiencing it, synthesizing it from a business point of view, and then writing the Capstone project. It was an absolutely transformational time." Getchell said the program helped her become a better strategic thinker, and a better communicator. "Just recently, I was able to share parts of the change process - asking questions like, ‘What's the compelling vision?' and ‘What are the obstacles we have to overcome?' with our leadership team," Getchell said. "I've learned to be more committed to conversations, and to come from a place of curiosity, without judgment. Honestly, I don't think I've gone through a day without using what I learned in the MBA program." When David Ross completed his Master of Arts in Management in 1993, he didn't know what kind of work lay ahead. But one professor in particular stoked his love of learning. "While I learned much from each of my professors, and am indebted to each of them, one professor captured my imagination in a way that fueled my interest in learning: Tony Barrett," Ross said. "He was an engaging, spirited, funny, and wise teacher. He made many three-hour evening classes pass quickly by beguiling us with his insight, his love for economics, and his storytelling." Ross remembers approaching his coursework with voracity, but also being able to digest and employ the material. "I was there to learn as much as I possibly could about the science and the art of leadership," he said. "Furthermore, I could implement what I learned in my evening classes as early as the next day." Now, 21 years into his role as President of the Duluth Area Chamber of Commerce, Ross fondly recalls the lessons he learned. The idea of effective communication is chief among them. "The Master of Arts in Management coursework emphasized the importance of effective communication," he said. "Each time I compose a presentation or an article, I do so with a hard-earned confidence that was developed while at St. Scholastica."